Once again, the ESDi School of Design participates as an organiser of the Nit de la Ciència de Sabadell, an initiative that proposes both the collection of funds for scientific research projects and the valorisation, at the level of citizenship, of these projects, especially seeking to promote young people’s interest in science. This year, the meeting will begin on 12 April with a series of activities. As part of its role, ESDi developed the graphic image of the 2018 campaign, which will focus on the “Revolution of the mini organs” in the framework of minority diseases, which represent a promising tool in the field of biomedicine, especially in the treatment of these diseases, which affect 20,000 people in the region. The campaign design, developed by the graphic designer of ESDi’s Press and Communication Office, Sandra Lamas, uses a test tube as a symbol of the scientific and research environment, while at the same time illustrating a stem cell from which different organs are removed to reflect advances in this field of research. In mid-February, the press conference presenting the Nit de la Ciència presented both this year’s graphic image and the programme of activities that have been planned. 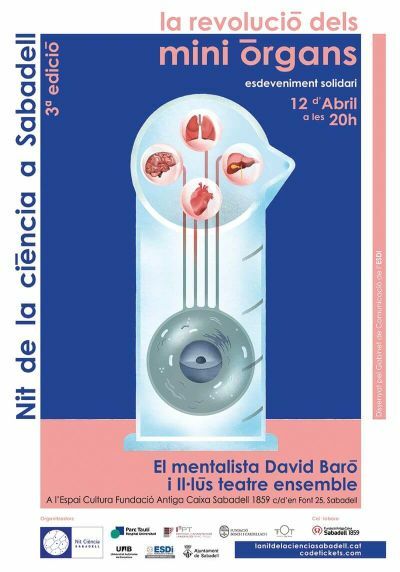 These will take place throughout the month of April, with a central event on 12 April that will include performances by the mentalist, hypnologist and national mentalism award winner, David Baró and, of the musical formation L’ ul-lus Teatre Ensemble. The aim of the initiative is to earmark the benefits for a project that investigates minority diseases and to create, in Parc Taulí, an organoid laboratory (mini organs) to test the efficacy of new drugs in a personalized and safer way for patients. This initiative is organised by the Autonomous University of Barcelona (UAB), Sabadell City Council, the Parc Taulí Foundation (FPT), the Bosch and Cardellach Foundation, the Olga Torres Foundation and ESDi. Tickets for the 12th of April show can be obtained at www.codetickets.com and cost 15 euros. You can also participate by purchasing tickets in row 0 (10 euros), attending the activities organized to give support (see the programme of activities: www.lanitdelaciencia.cat) or making a direct donation to the account Parc Taulí Foundation ES02 0081 5154 2900 0181 3582 with the concept “Projecte Nit Ciència 2018” (contact for certificate donation rrenom@tauli.cat).